You know the characters, you know how the story turns out, you've seen or heard it a dozen times on TV or video or on the radio or on a record. You may even approach the evening at A.C.T. Theater with trepidation, saying to yourself "Oh, Man! A Christmas Carol AGAIN? We'll be out of there by Act Two." Humbug. You'll be on your feet at the end of Act One AND Act Two, shouting "Bravo! or "Fezziwig!" If you are like this writer, you will want to grow up to be just like Scrooge. 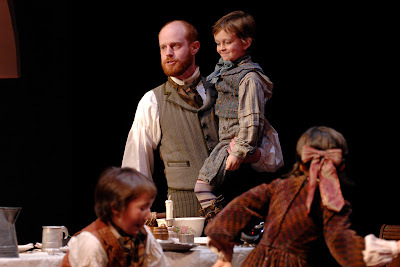 You get good Bob Cratchit (the excellent Jud Williford) and his poor but humble family, including crippled Tiny Tim. You get bad Ebenezer Scrooge whose last name has come to define skinflintedness for more than a hundred years. Toss in the Ghosts of Christmas Past, Present and Future. The result is the triumph of lightness over dark, of good over evil. 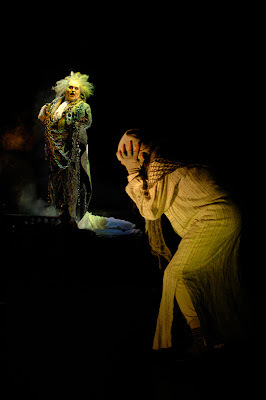 Ah, but you are not prepared for James Carpenter, whose Scrooge at the opening is frighteningly formidable, but by the time the ghost of Bob Marley (Jack Willis) gets done with him has become a groveling, frightened old man before our eyes. You are not prepared for John Arnone's sets (if you've ever drunk a quart of spoiled egg nog maybe you'll recognize the deep green and horrific specter of Christmas Future) and Beaver Bauer's costumes, especially the two Spanish Onions and two Turkish figs, played by children, who captivate us in the audience as they are doing so to Ebenezer on stage. This is not children's theater in Gilroy, friends; it's the big city, with music, dancing, fabulous acting and full production values. It's so easy to be a grinch and complain about all the Christmas-y overkill we must all face each and every year. With 'A Christmas Carol' perhaps we have the antidote. Take one and blog me in the morning. The San Francisco Theater Blog Awards Division awards A.C.T. 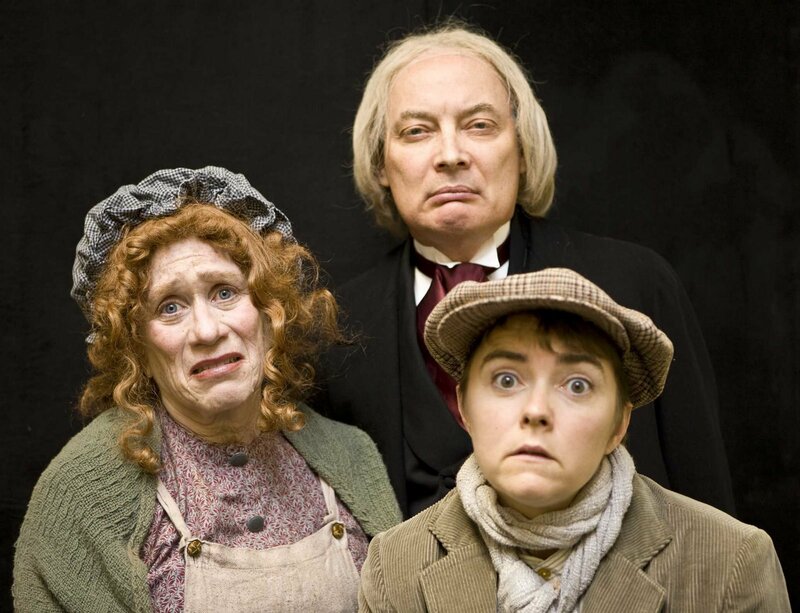 's 'A Christmas Carol a full star and a half for Scrooge himself ("Fell in Love? BAH! "); a star for the memorable dance sequence at the Fezziwigs' party; another for Marley rising out of Scrooge's bed (Take THAT, Sigmund Freud), plus all the Ghosts of Christmas Whenever. A special BANGLE is awarded for the priceless moment on Opening Night when Bob Cratchit and family were gathered around their meager Christmas repast on stage, and a little voice called out from somewhere in the second balcony: "Mewwy Cwistmas to you too!" Are you smiling? This is for the way you get to feel when you walk out of the theater after the final curtain calls. 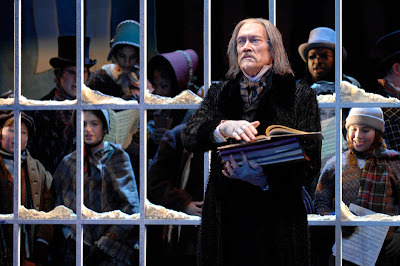 If you don't like 'A Christmas Carol,' you must be a Republican. The combination of a wonderful premise, plus the appearance of many favorite Bay Area actors, keep Act One of 'Mrs. Bob Cratchit's Wild Christmas Binge!' lurching forward at a rewarding and hysterical pace. The audience identifies strongly with long-suffering Mrs. Crachit, played to exasperated perfection by Joan Mankin, whose life with her impoverished do-gooder husband Bob (a showcase role for Keith Burkland) has driven her to the point of suicide. Little Tiny Tim (Lizzie Calogero) is as optimistic as only an idiot can be (Mommy! I only fell down 24 times today!) and Mrs. C.'s husband's employer Ebenezer Scrooge has just cut Bob Cratchit's meager salary in half. Li'l Nell (Jean Forsman) has tried to purchase presents for the entire family, but she has only been able to gather enough money for the wrapping. This pushes Mrs. Cratchit over the edge. She decides to abandon her family, including the 20-plus adopted street urchins who live somewhere down in the root cellar, and head straight to the nearest bar, get drunk on Tequila Sunrises and then throw herself off the London Bridge into the Thames. So far, so silly and so wonderful. But oi. 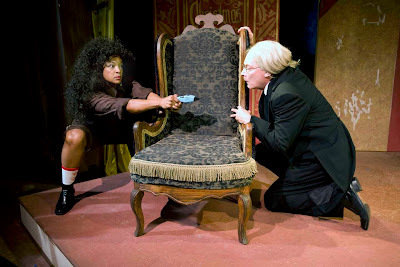 The second act of Christopher Durang's 2002 spoof becomes mired in slapstick that might have been cute in New York five years ago but is mostly mystifying now. The actors try (Victor Talmadge as Scrooge stays perfectly in character despite an incomprehensible romance with...Leona Helmsley? Yes. ), but there's only so much they or director Joy Carlin can do. Those who remember SF Playhouse's excellent 'Reckless,' by Craig Lucas, another demented Christmas story that was mounted at the same time last season, will not exit the theater with the same enthusiastic feeling. But there are terrific moments, among them the finest and funniest version of 'Silent Night' you'll ever hear on a stage. Perhaps some day the playwright will reprise Mrs. Bob. Anyone who has ever felt dark thoughts about Christmas will continue to cheer for her. The San Francisco Theater Blog Awards Division awards 'Mrs. Bob Crachit's Wild Christmas Binge!' one star for Keith Burkland and Joan Mankin, whose Mr. and Mrs. Bob Cratchit take suffering to a new level; another for the way the smooth production team manages to move all those scene changes on and off a small stage; and half a star for Cathleen Ridley's channeling of Billie Holiday at the opening of Act Two. A very special bangle is awarded for that slow-slower-slowest version of Silent Night and another bangle is shared both for tasering Scrooge and for keeping Ken Lay on the Bad Guy Front Page. Two and a half stars with two bangles for 'Mrs. Bob Crachit's Wild Christmas Binge!' Laughs are rare at Christmas. You get quite a few here. Dan (Kevin Rolston) and Windsong (Alison Jean White) are pregnant and both are happy to be. Jasper (T. Edward Webster) and Melinda (Makela Spielman) are not pregnant, but one of them wants to be. Karen (Lorri Holt) and Tom (Charles Shaw Robinson), seen below, are not pregnant and neither one wants to be. The implied premise in Rebecca Gilman's 'The Crowd You're In With,' having its World Premiere at the Magic Theatre, is that kids ruin everything. The problem is that everyone at the barbecue in Jasper and Melinda's back yard is already having a perfectly miserable time. It's hard to imagine how much worse a brood of kids could make it. Tom and Karen are Jasper and Melinda's landlords and they are a generation older. Their decision to never have children has made the younger couples uncomfortable, especially Jasper, who's not so sure he wants to have a child anyway. It's a squirmy afternoon in old Chicago, and director Amy Glazer keeps the pressure up by piling on one liner after one liner. For example, Tom reminisces about how no one ever came to see any of the old people in the home where his grandmother lived out her old age. "Is there more pain in having no one to come see you," he asks, "or knowing there's someone out there who doesn't come?" "The Crowd You're In With" is a flash photo of an angst-filled moment in time. If the decision of whether or not to have children resonates with you, you'll enjoy the show. If not -- it's only one act and there's time to go home and call the kids. The SF Theater Blog Awards Division awards "The Crowd You're In With" one star for Alison Jean White's Windsong, who keeps coming up with charmers like: "Not to be anti-Polish, but they're a bunch of thugs." The rock-and-roller Dwight (Chris Yule)'s rant against people with children, who come to the restaurant where he waits tables, is wonderful and earns another star. A Bauble of Despair has to be acknowledged, though, because they had to make Dwight look so much like Jack Black. In fact, there are no musician cliches that Gilman missed -- you know, they're stupid, they're freeloaders, they want children but don't want to do any work. Does the reviewer have thin skin? Perhaps. Two Stars with a Bauble for "The Crowd You're In With." It's pretty good. When you have a ratings system based on stars and BANGS, there is only one way to rate the new Cirque du Soleil show KOOZA: Star! BANG! Another BANG! Another Star! Whooo, did you see that? STAR! BANG! BANG! This is a magnificent show. 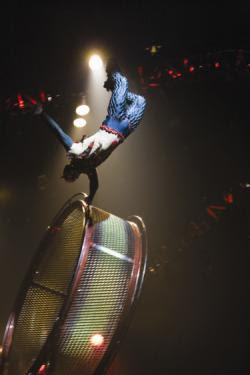 Gone are (most of) the irritating features for which Cirque du Soleil has become infamous, like canned music and (some of the) idiotic warbling in made-up languages that sound like Elves broke into the syntax machine. The show is backed by a terrific live band and, Glory to God, at one point they roll a riser to center ring and a fabulous drummer takes a featured solo! Production values are still state-of-the-art, but they do not dominate. Kooza is a return to the old days of Cirque du Soleil, where the show is about the circus acts, not vice-versa. 1) Contortion OH MY GOD! BANG! 3) Duo Unicycle HOLY SHMOLY! BANG! 6) Wheel of Death. YOU HAVE GOT TO BE KIDDING! NEVER SEEN ANYTHING LIKE THIS. BANG! 8) Juggling THE BEST JUGGLER IN THE HISTORY OF THE WORLD! BANG! 9) Chairs Balancing NO! NO! PLEASE DON'T TRY THE ONE ARMED HAND STAND ON THAT LITTLE TEETERING CHAIR FIFTY FEET IN THE AIR! OHMIGOD HE DID IT! BANG! Through it all, clowns run amok, the sets are outlandishly cool, you've got lights and smoke and cannons firing confetti and the big top in the Giants Stadium parking lot is cozy and packed and it all feels like a major Big-E Event. 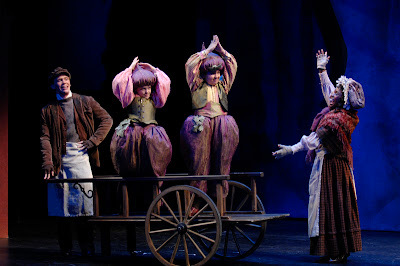 The SF Theater Blog Awards Division awards Cirque du Soleil's KOOZA Four Stars with five BANGS. Yes, that's a lot of BANGS for the buck. But this is one of those rare occasions where big bucks and big sponsorship translates into brilliance. No middle-of-the-road play-it-safe stuff here, only one giant intake of breath after another. The three women contortionists at the beginning, the extraordinary dancing pair who somehow make you forget he is riding a unicycle, the absolutely heart-stopping wheel of death and the magically understated gymnast in a white thong balancing on ever-higher constructions of chairs -- well. Don't miss KOOZA. This reviewer, a noted cheapskate, is thinking about tickets for the family for Christmas. That ought to tell you something. You can't say 'Slouching Towards Disneyland' is not clever and you can't say there aren't funny moments, even a few touching ones. You can't say Merle 'Ian Shoales' Kessler isn't an appealing front man and you can't say the concept of the world as an endless and mindless 'It's a Small World After All' theme park ride doesn't ring eerily true. It is probable there is a built-in Bay Area audience for Kessler and sidekick Joshua 'Raoul' Brody and their anti-modernity rants, which may become more focused when the two men have had a little more time to learn their lines. They may find themselves choosing to banter less and sing a little more. No would ever say these two are untalented guys. It's nothing short of amazing that Kessler danged near pulls the drowning cat out of the river at the very end when the Disneyland references FINALLY start to pay off the intriguing first line of the show's first song: "I found myself in Anaheim with a little time to kill." But shoot. You can't say the audience gets to grow during the performance. You can't say one feels much empathy for the two curmudgeons on stage, unless you already felt that way before you came to the theater. And you can't say the show is worth running down to the Marsh to see, not yet anyway. But we've all seen inspiration from Kessler and Brody in the past and it's quite possible the Slouch may, in time, stand up, jump out of the motorized cart and start to evolve into something fascinating. 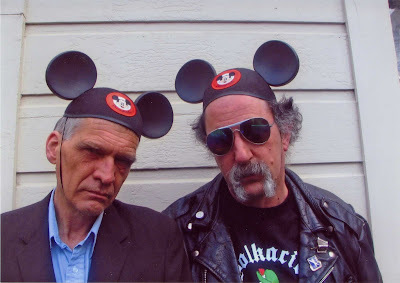 The SF Theater Blog Awards Division awards 'Slouching Towards Disneyland' one star for the absolute hubris of defining the topic for the evening as 'everything that ever happened since the beginning of time.' Another half a star is given for Kessler's very pleasing solo voice but that uber-irritating tape loop that Brody keeps gleefully drawing from his Mac (it repeats 'The Dustbin of History...The Dustbin of History' like it actually means something) receives a bauble of despair. A special bangle goes out for the intriguing line: "Skin is to tattoos what memory is to computers." Not sure what it means but it's too cool to go unrewarded. As the curtain was rising at A.C.T. Theater, the Calaveras Fault came a-rumbling to the tune of a 5.6 earthquake. The floor shook a tiny bit and maybe the first balcony hiccuped, but the venerable 1910 theater laughs at 5.6. Then the curtain went up on Mark Rucker's production of N. Richard Nash's 'The Rainmaker.' Written in 1954, the very successful show spawned several revivals, a 1956 film starring Katharine Hepburn and Burt Lancaster, and even a musical ("101 in the Shade") in 1963. So the show is 53 years old. That's good and bad. Rene Augesen has the starring role as Lizzie who thinks she's plain, and she makes the most of a stock female character. Augesen makes us feel for Lizzie, suffering from a lack of options in her hot and dusty farmhouse, but, sadly, there is no one opposite her to root for. She can't be Maria without Tony. Even Julie Jordan had a bad-to-the-bone Billy Bigelow. But Lizzie is stuck in the middle. Her kinda-sorta beau File (Anthony Fusco) is a banana slug (spineless arthropod - check it out) while her rainmaker hero Bill Starbuck (Geordie Johnson) could use an extra jolt of high-caf snake oil. We want to believe Pretty Bad Bill could captivate Good Lizzie. In 1954 this may have been possible. Reality is closer now. As nights at the theatre go, "The Rainmaker" looks fantastic. Robert Mark Morgan has designed a farmhouse that makes you want to lay down on the sofa and eat popcorn, but then that farmhouse splits in half and the sheriff's office rolls up and flies down center stage. It's masterful and period at the same time. Beautiful. As far as ratings go, The SF Theater Blog Awards Division awards "The Rainmaker" a star for the gorgeous sets, a star for Rene Augesen and Jack Willis (who was so good as Ben Hubbard in last season's 'The Little Foxes'-- he's seen above on left) and a half star for the very fine performance of Alex Morf as Jim Curry, who brings some badly needed fire to the Currys. A Bangle is awarded in self defense as the critic realizes his wife, his (female) friend and his (female) friend's daughter liked the show somewhat more than he did. Plain girl gets guy: women love it. You can't predict earthquakes, but this you can. 'Six Degrees of Separation,' John Guare's 1990 Broadway hit which was turned into an even more successful film in 1993 starring Will Smith, Stockard Channing and Donald Sutherland, is back on stage at SF Playhouse. It features a standout performance by Daveed Diggs as Paul and excellent starring roles by Robert Parsons and Susi Damilano as the art dealer Flan and his wife Ouisa. Guare's story is not a comfortable one for theater audiences, who are for the most part the age of the clueless parents in the story. Their kids despise them (Jennifer Siebel shines as the spot-on perfect daughter Tess -- "I'm getting married and moving to Afghanistan...") and the parents' acquisitive lifestyles have left them perfect targets for the conniving Paul, who pretends (brilliantly) to be the son of actor Sidney Poitier. Three sets of parents are taken in by Paul's deception. In the first act (the show is 85 minutes with no intermission), the empty lives of each parent are exposed for all to see. As a result, when their children appear in Act Two, and we find them played so over-the-top and self-absorbed, we have no choice but to try to start rooting for their parents again and that isn't easy to do after Act One. We have to choose between Crazy and Delusional or Shallow and Defamatory. 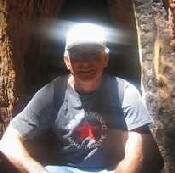 What we want to know is why Paul, clearly a genius, has become so disturbed and crazy. But you don't get neat story-packages with John Guare, and Bill English's spare production gives us no further inklings. That said, the show keeps everyone honest as many truths hit close to the bone. "Six Degrees of Separation" deals with deception and racism and class but at its heart it is about loneliness. Each flawed character is, in the end, looking for a new experience, for something more than they have, even though they are smart enough to know that what they are hoping for will not be quite what they find. Flan says it best: "The imagination is not our escape. On the contrary. The imagination is the place we are all trying to get to." The SF Theater Blog Awards Division awards "Six Degrees of Separation" a star and a half for Daveed Diggs's bravura performance, another star for great lines like: "In the black newspapers, the theater section is right next to the want ads" and a half star for the way the ensemble moves flawlessly through a difficult plot with no intermission. 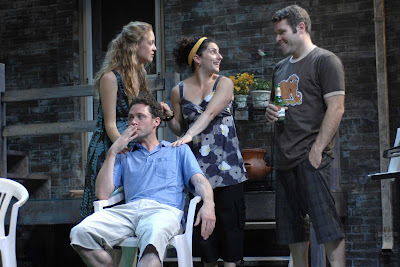 Plus, there is a Bright Bangle for Ken Sonkin's South African, Jewish and (Italian?) Detective accents. The play also receives one upside down question mark <¿>: this reviewer will admit RIGHT NOW that, after seeing the play and the film and reading countless commentaries, he still can't figure out what 'six degrees of separation' has to to do with...well, anything. But nobody else seems to be having any problem with that, so John Guare has the last laugh. Three Stars, a Bangle and an UDQ for "Six Degrees of Separation." Go see it. Daveed Diggs will knock your socks off. Haruki Murakami's two short stories 'Honey Pie' and 'Superfrog Saves Tokyo' are the basis for "After The Quake," playing on Berkeley Rep's Thrust Stage through November 25. The 85 minute production (with no intermission) is like Tokyo in the summer -- complex, crazy and a little steamy. The show starts slowly, as the five-person cast switches roles and takes turns at narration. 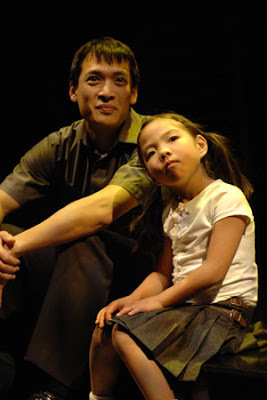 But Frank Galati's direction is so crisp, and the cast so riveting -- is the remarkable Paul H. Juhn REALLY playing both the mild mannered Katagiri and the young, strutting Takatsuki? -- that when the dream-within-the story-within-the play format finally emerges, it does so with explosive power. Hanson Tse and Jennifer Shin do a marvellous job as the two shoulda-been lovers Junpei and Sayoko -- or maybe they actually do become a couple, unless it's just another of Junpei's stories. Murakami's work is always multi-layered, so don't expect to get everything. As Frog says, quoting Nietzsche: "Understanding is the sum total of all our misunderstandings." Oh, that know-it-all Frog. He quotes not only Nietzsche but Conrad, Hemingway, Tolstoy and Dostoevsky. 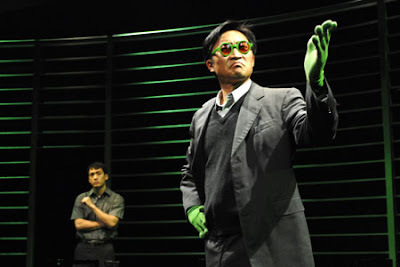 Costumer Mara Blumenfeld has dressed him in a three piece suit with green gloves, green socks and green glasses, and that incongruous getup helps the marvelous Keong Sim give Frog a combination of agent of salvation and Yakuza mobster. Frog is defintely The Man. Kudos to the live duo of Jason McDermott on cello and Jeff Wichmann on koto, always in gauzy view of the audience while playing. But one small niggle: everytime they play the Beatles' 'Norwegian Wood,' in an otherwise Asian-inspired score, it feels terribly out of place. Sure, the cognoscenti will know that another Murakami short story is entitled 'Norwegian Wood.' Others -- who, me? -- find it jarring. The SF Theater Blog Awards Division awards "After The Quake" one star for Murakami's beautiful language, one star for acting and direction, one star for the costumes and sets and another half for getting a child actor (six-year-old Gemma Megumi Fa-Kaji alternates with nine-year-old Madison Logan V. Phan) to speak her lines with such power; a Bangle is awarded for that amazing audience-gasps-moment when Paul H. Juhn throws off Takatsuki and becomes Katagiri before our eyes. 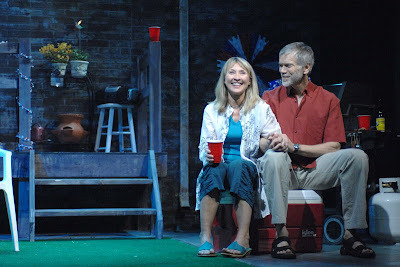 Three and a Half Stars plus one Bangle for "After The Quake" and remember: at Berkeley Rep's Thrust Stage every seat is a good seat. Amanda Moody and Footloose want you to approach Moody's one-woman show "D'Arc" with aloof hipness. The set is sparse, there's an electronic cellist in high heels on the stage and the fellow two seats down is asleep before the show starts. But it's hard to remain aloof with Amanda Moody -- she's Too Darn Hot. 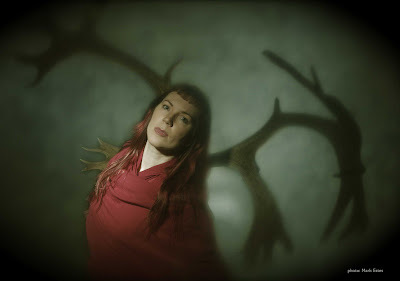 With bright red hair and a rapturous smile, she opens as Joan of Arc, with a thick French accent, sallying into battle on her horse; she then morphs into a mother sounding like she's from Little Neck, Queens, who is desperately trying to locate her missing daughter Joan; and the daughter herself, a do-gooder who has disappeared somewhere in Afghanistan, where she was attempting to teach beauty tips to local burka-wearing women. A box wrapped in white paper drops from the ceiling at some point, as Moody takes us back and forth, from character to character, filling out her story and making us sweat, as we keep wondering WHAT IS IN THE DAMNED BOX? 'Hip Show' usually just means 'weird sophomoric music,' but D'Arc's music, composed by Jay Cloidt, has intriguing depth. It helps that Moody is a trained singer and superb performer. Indeed, one gets into the car afterwards singing "Everyone Burns, Everyone Burns," and it may not be all that uplifting but you do exit singing. D'Arc is an excellent and thought-provoking show, very much worth seeing and bringing your friends along. Arrive with your own chocolate, though, because the show is an hour and a half long with no intermission. When they lop ten minutes off the ending, D'Arc will be even stronger and the guy two seats down may wake up. SF Theater Blog awards "D'Arc: Woman on Fire" three stars for Moody's story and performance, plus one Bangle for the way she stomps incomprehensibly off stage, down the stairs and out the front door with a loud slam -- and the show isn't even over! -- and one Bright Bauble for when they shorten the ending -- it's over when the door slams, folks. Three Stars, A Bangle and a Bauble for D'Arc and a long round of applause in both English and French.